Consumers of online business content recognize and value content marketing. Businesses that produce high-quality, transparent content marketing provide value for consumers, whose interest in a business increases after engaging with content marketing. Content marketing benefits businesses that produce it and business audiences that consume it. We surveyed 384 employees who have consumed business content online in the past week. We found that these audiences value content marketing, even though they can easily identify when the business content they consume qualifies as content marketing. Our first report on this data discussed how B2B audiences encounter and engage with business content online. Businesses can use this report to understand how content marketing is an effective tool for engaging prospective customers and improving SEO, particularly in the business-to-business (B2B) space. Sixty percent of people (60%) recognize the most recent business content they consumed online as content marketing. Most people (86%) are confident they can recognize content marketing. Audiences recognize content marketing when content is published on a company’s website (27%), links back to a particular company (21%), or includes the company in the author bio (21%). Two-thirds of people (67%) consider content marketing useful and valuable, outweighing the 33% who consider it biased and unreliable. Content marketing aims to move people through a company’s sales funnel. 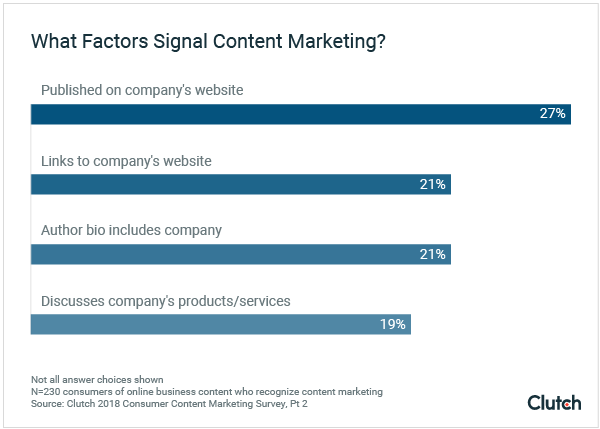 After consuming content marketing, more than half of people (53%) are more likely to revisit a company’s website and 50% are more likely to research the company's products. Content marketing drives sales. 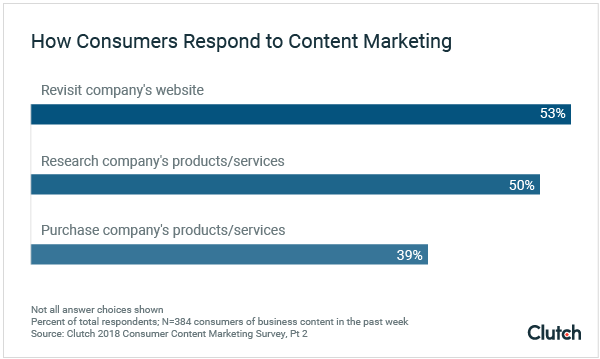 Most people (82%) have purchased a company’s products or services as a result of consuming content marketing, indicating its value for businesses. The online business content people most recently consumed likely was part of a company’s content marketing strategy. Sixty percent of audiences (60%) say that the online business content they consumed in the past week was produced by an individual representing his or her business. When audiences encounter content marketing, they know it. Nearly 90% of people are confident when they identify online business content as content marketing. This data demonstrates the popularity of content marketing, particularly among B2B marketers. According to Content Marketing Institute, over 90% of B2B marketers use content marketing to engage their audiences. “If people are marketing their own products and services online and have a website they write content for, they assume that [the content] they consume is also produced by someone doing the same thing,” said Matt Travers, executive vice president of Lead to Conversion, a digital marketing agency based in Cleveland. Because consumers of content marketing are often business people, they are also likely to invest in content marketing and recognize that the business content they consume online was produced for a business purpose. Audiences use cues to identify content marketing among the business content they consume. The most common identifier is also the most obvious: The content was published on a company’s website (27%). Over one-fifth (21%) notice when content links back to a particular company’s website or identifies the author’s company in their bio. A similar percentage (19%) notice when content discusses a company’s products. The methods people use to recognize content marketing reflect both the diversity of content that businesses publish and the number of online channels available for consuming content. The number of businesses that invest in content marketing, combined with the number of content channels online, means that consumers are exposed to content marketing more. 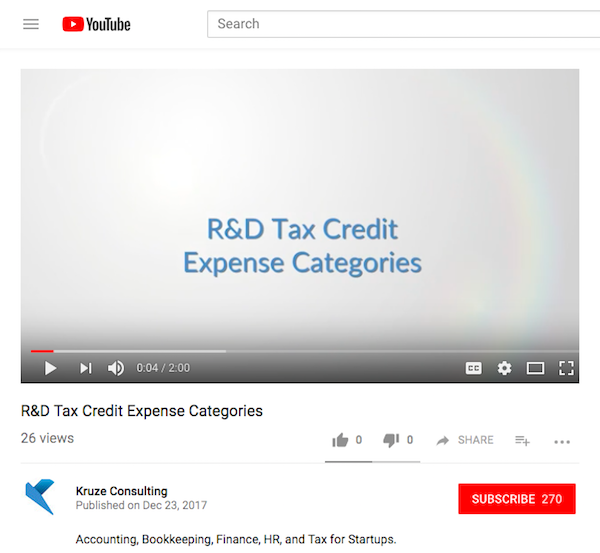 For example, Kruze Consulting, an accounting firm that serves startups, repurposed its research and development (R&D) tax credit calculator for content marketing by producing an explainer video that outlines which R&D expenses are eligible for tax credits. Kruze Consulting uses its R&D tax calculator as a functional marketing product that both attracts customers and helps them decide whether to purchase their product. People who watch this video can easily recognize it as content marketing since it explicitly suggests that consumers consider using Kruze Consulting's tax credit calculator. Although consumers frequently recognize content marketing, they still experience value from consuming it. Most people who consume business content online value content marketing. Two-thirds (67%) believe that content marketing is useful and valuable. The remaining 33%, however, believe content marketing is biased and unreliable. Companies understand that consumers won’t even bother to consume content that lacks value or quality. When content marketing is transparent and high-quality, however, consumers derive more value from it, even if it has a noticeable promotional slant. Originality: People want to consume content that provides new information or unique points of analysis about a topic. Narrative: Business content can tell a story. Use narrative elements in your content – for example, storylines, case studies and examples, and themes – to keep consumers engaged. Discussion of Common Customer Issues: Prove you understand your customers' points-of-view by discussing common issues your customers face. Actionable Tips For Consumers: Discuss solutions to solve customers problems, rather than just stating that they exist. This builds trust with customers since you not only understand their issues but also know how to solve them. High-Quality External Sources: High-quality content authoritative, trustworthy sources for support. Producing transparent content that integrates these elements helps you address and solve customer issues in a compelling, original manner. Doing so captures consumer attention and drives interest in your company. Content marketing benefits businesses that invest in it. We found that audiences who consume content marketing are more likely to advance through the stages of a company's sales funnel and ultimately convert to customers who invest in the company's products or services. High-quality content also improves your company's search rankings, which drives further engagement. People who engage with business content online have an increased purchasing intent. Over half of content marketing consumers (53%) are more likely to revisit a company's website to learn more about the company. Half (50%) are more likely to research the value of a company’s products and services. Content marketing improves website's SEO. By ranking for relevant keywords, content marketing increases consumers' awareness of your company's products and services. To capture potential customers in the awareness stage, focus on producing content that gives you a chance to appear in the results of relevant search queries. Customers at this stage are searching for information about an industry, company, or service, and likely use search engines to do so. If your company produces content that speaks to issues that customers may use search engines to address, you improve the chances that Google indexes and displays your content among the results for those searches. Because customers at this stage are intent on learning more, rather than purchasing, consider producing content that is easily consumable and provides clear takeaways. Blogs: Produce blog posts that discuss customer issues and FAQs in easy-to-read formats, such as lists and "how-to" pieces. Email Newsletters: Send easily skimmable emails that allow consumers to easily recognize and consume content that they find relevant. Infographics: Display content in a visually compelling manner using an infographic. 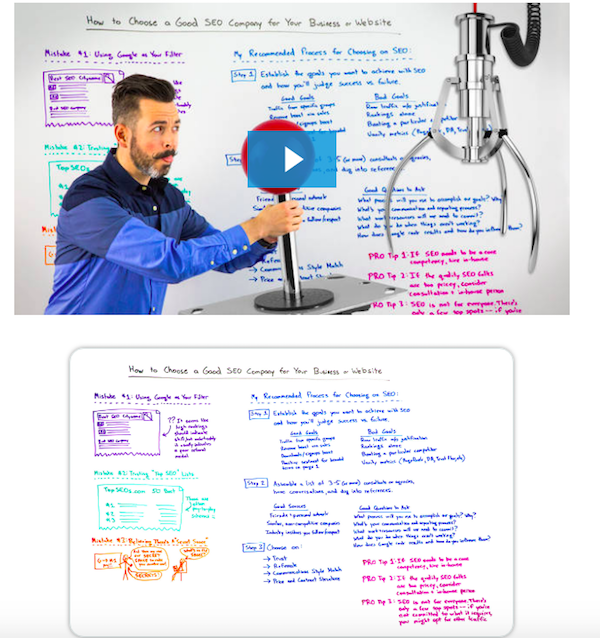 For example, Moz, an SEO software provider, produces a popular "Whiteboard Friday" video and blog series that discusses SEO and other search marketing topics. 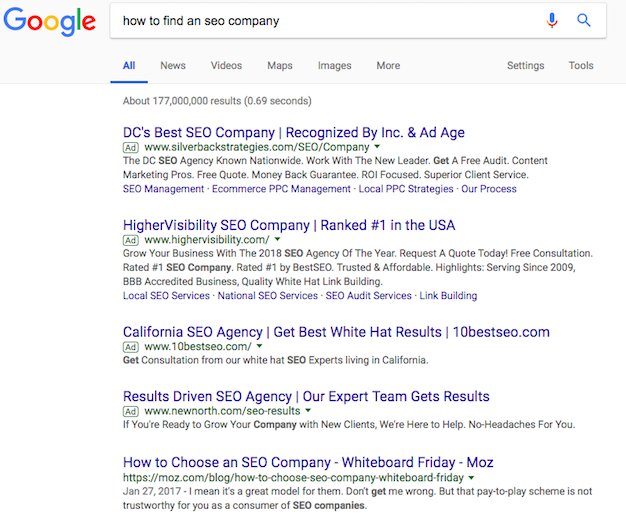 This content is engaging, provides actionable tips, and speaks to a common concern for customers in the beginning stages of their sales journey: How to find an SEO company. As a result, Moz's content earns significant consumer engagement, which helps it achieve strong search rankings for relevant search terms, such as "how to find an SEO company," for which it captures the top organic result. Establishing brand awareness such as this through search engines is incredibly valuable, especially for businesses that target B2B customers. Driving and Retaining Web Traffic: If you produce in-depth, original, and compelling content, people will visit your company's site to consume it. Earning Backlinks: High-quality, relevant content serves not only as a sales tool but also a resource for industry insight. This means other people that produce content on the topics you cover will link to your content as a qualitative source. Each of these has a positive impact on your SEO: Content and links, in particular, are 2 of the top 3 factors Google considers in its search rankings. Content marketing supports SEO, which in turn increases your chances of capturing customers in the awareness stage. Once your content marketing establishes awareness of your company, it drives customers toward the bottom of the sales funnel – the "decision" and "action" stages – during which consumers decide about whether they purchase a product or service and from which company. For customers at these stages, your business should focus on producing content that is more focused on your services and products and how they serve to benefit customers. Product Descriptions: Provides details about your company's products and services and how they serve to benefit your consumers. Explainer Videos: Teaches consumers how to use your products and promotes them as an effective tool for their needs. Kruze Consulting's video is a great example of this. Case Studies: Illustrates the value your company and your products and services can provide for your customers. Ultimately, content marketing makes consumers more likely to convert on your company’s products and services. Eighty-two percent of business content consumers (82%) have purchased from a company as a result of content marketing. The high number of customers who have purchased goods or services as a result of content marketing demonstrates its value. To achieve conversions from your content marketing, however, experts emphasize that it needs to have real, actionable value. Of course, the content you produce needs to provide value to motivate consumers to advance through your sales funnel and ultimately convert. People who read business content online are very likely to encounter content marketing. Business audiences are very confident when in their ability to identify content as content marketing and use various cues to recognize it. Overall, people find content marketing valuable and useful, particularly when businesses are transparent and produce high-quality content. Businesses also benefit from content marketing. High-quality and valuable content marketing effectively transitions consumers through a company's sales funnel and resulted in a majority of audiences converting on a purchase in the past. It also encourages consumers to engage with your content, which helps improve your company’s SEO. Clutch surveyed 384 employees who read business-related content online in the past week to learn how they encounter, recognize, and react to content marketing. Eighty-five percent (85%) of the respondents were full-time employees; 15% were part-time employees.